If you've been reading this blog for any length of time then you probably already know that I am one of two resident attorneys on staff here. As of yesterday, I quit my law firm job of 5 years doing what, to me, was a very comfortable practice in order to step out and try something new. New firm. New location. New people. New bosses. New everything. New can be very scary. In fact, the concept of doing something new is so scary to some people that they can't even entertain the thought of doing anything else. That was certainly the case with several people I talked with during my final 2 weeks at my old gig. Don't get me wrong, the reaction from most people was congratulatory, but every now and then I'd see a glimmer of what I can only describe as a combination of bewilderment perhaps mixed with a little bit of awe and a touch of inspiration as some of my former co-workers tried to come to terms with and fully understand how on Earth I could leave such a great job. A job, mind you, that many a law school graduate would kill for. Especially in this economy. 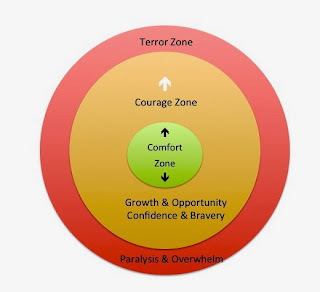 So today I want to talk about what it is that makes us step outside of OR stay inside of our comfort zones. I never really tripped off of the fact that I had developed a pattern of stepping outside of my comfort zone until one of my frat brothers pointed it out to our entire chapter recently during a formal banquet where I was being recognized by my undergraduate chapter for a leadership award. He said something to the effect of "this guy graduated with an engineering degree and was working at a big engineering company in Kansas City, making good money, driving a BMW, etc. As far as I was concerned, this guy had made it. But he didn't stop there; he gave all of that up and went on to law school on the east coast and now he's a big time lawyer in New York." Obviously, as the subject of his story, I was well aware of the events of my life that he had recited to the group, but I had never really viewed it from that perspective before. I didn't think of it as doing anything great or anything out of the ordinary. I just thought of it as a natural progression much in the same way that a kid goes from elementary school to middle school and then from middle school to high school. But when he told it in that way, I had to stop and ask myself: why did I step out of that comfort zone? Most people would have stopped right there, right? I distinctly recall one of my fellow engineering co-workers telling me: "I'm probably going to be working at this company for the rest of my life." A few weeks after she said that, I quit that job, packed up all of my belongings and made a road trip with Fed Up and another friend halfway across the country to go start law school in a state where I literally had no family or friends. After Fed Up and my other buddy hopped on the plane to head back to the midwest, I sat down on one of the benches outside of the airport and felt overwhelmed by the realization that I was on my own in a part of the country that was truly foreign to me. I must have sat on that bench for like an hour just letting it sink in. When I started law school the next day, I was driven. Focused. Determined to be the best of the best if for no other reason than the fact that I had gone "all in" as they say in poker. In other words, I had completely stepped outside of my comfort zone in order to go to law school. Looking back on it now, I had numerous classmates who, for the most part, stayed within their respective comfort zones while attending law school. For some, it was the family trade. For others, it was just an extension of college. And even for those who, like me, were the first in their family to attend law school, only a handful had actually left their home state to be there. Most of my classmates were east coast locals. When they went home, many of them saw their family and friends on the weekends and hung out as they had always done their entire lives. When I went home, all I had was four walls and a bunch of law school text books to keep me company. End result: I made law review, graduated towards the top of my class, and am one of the very few people among my classmates who survived law firm life long enough to be considered for partner. Had I stayed back in the midwest, it is difficult to see how any of those accomplishments would have been possible. But I've never really been one to accept the status quo as my reality, so here I am years later having accomplished all of that and still plotting on how I can achieve even more. "Only in giving up the security of the known can we create new opportunity, build capability, and grow influence." It's human nature to come up with a million and 1 reasons on why we can't do something new. But if we're honest with ourselves, we already know that if we keep on doing what we've been doing then we're going to keep on getting the same results that we've always been getting. If you're lucky then you realize that is true. I think most people are so busy with their day to day lives that they never even make that connection. So even coming to that realization is an accomplishment in and of itself. But even after we come to that realization, most people are too afraid of the risk of trying something new. Even if they're in a bad situation. Better to keep the Devil you know than to step out and try something new, right? Hopefully, you don't agree with that. 1. 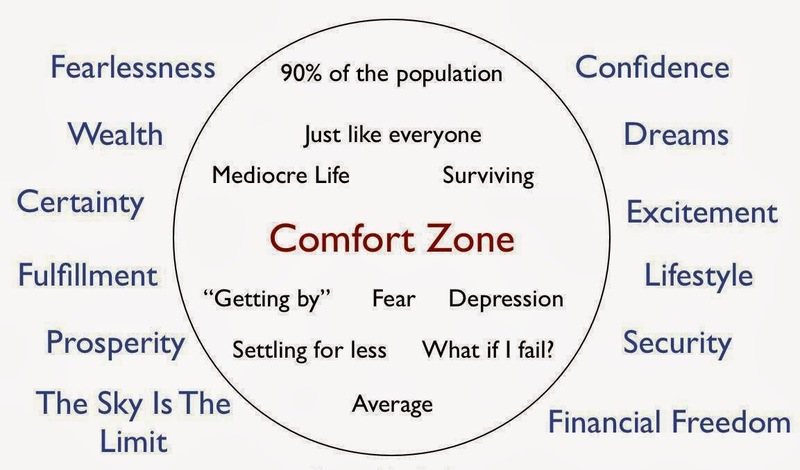 Has your comfort zone been holding you back on doing something? 2. What do you plan on doing about it? 3. 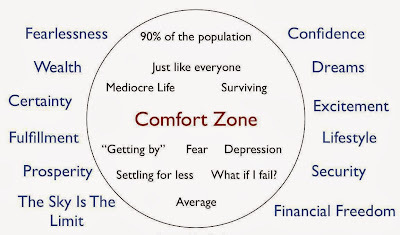 What circumstances would make you break out of your comfort zone?